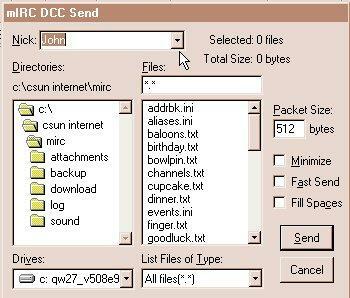 One of the most useful features of IRC is the ability to Send and Receive files. This feature allows you to share all kinds of information with other people on IRC. Students can submit drafts or working documents or you can return assignments. 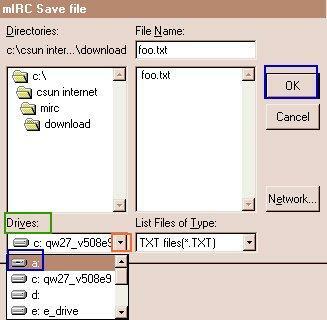 Any file can be transferred while on IRC. 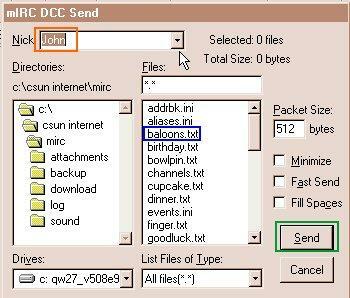 On IRC, a method called DCC Send and DCC Get is used to connect directly to another person on IRC to Send and Receive files. You can then enter the nickname of the user, select the file you want to send by clicking on it and it will appear where the *. * is, and then click on the Send button. 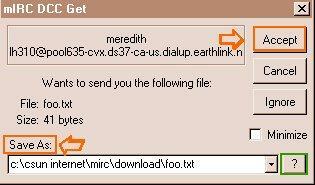 mIRC will then tell the user that you want to send them a file. 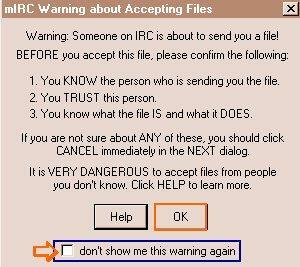 If you receive the following mIRC Warning About Accepting Files, after you read it you can put a check in the box on the bottom so that you are not bothered by that screen again and click OK. The user then has to accept your send request. Select the drive that you want to access and then a dialog box will be displayed to indicate where the file will be saved. Select OK. The following dialog box will appear and you need to click on Accept. If a user tries to send you a file that already exists in your directory then you will be shown a warning that the file exists. You then have the option to either overwrite, resume, or rename the file. If you select overwrite then the whole file will be downloaded from the beginning and any existing file of the same name will be erased. 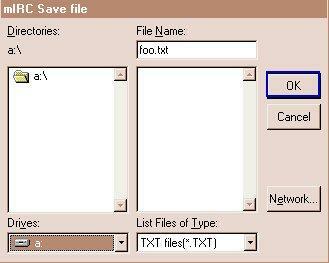 If you are not sure you want to erase the existing file, rename the new one. 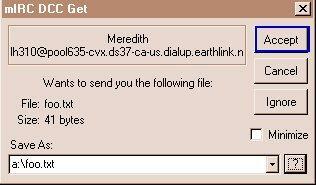 At this point the file transfer will begin and a dialog box will indicate progress. Close the window by clicking on the X in the right corner of the box.